You’ve heard Vancouver and BC blame the federal government, and rightly so, for dropping the ball in their response to the spill. But these are far from the only criticisms to be levied in the responses to this spill, and blame can, and should, be placed on many different levels of government. It’s not like we couldn’t have seen this coming. 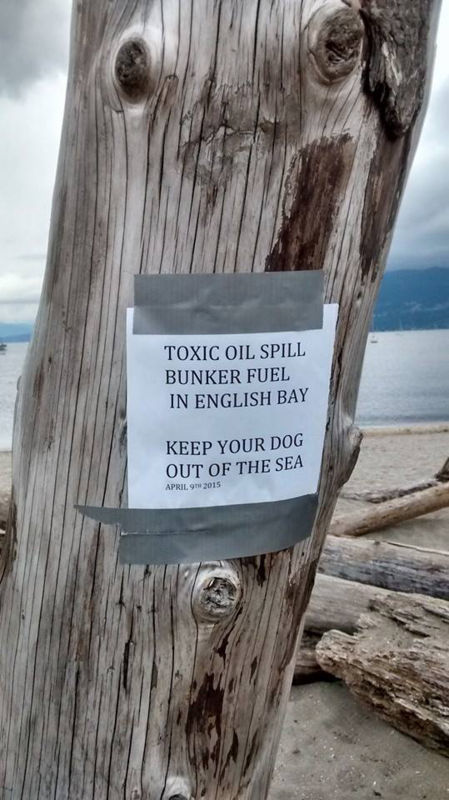 Except for the 60s, unless someone can dig up one I missed, there has been at least one bunker fuel spill every decade since the 50s affecting the waters off of the Lower Mainland. 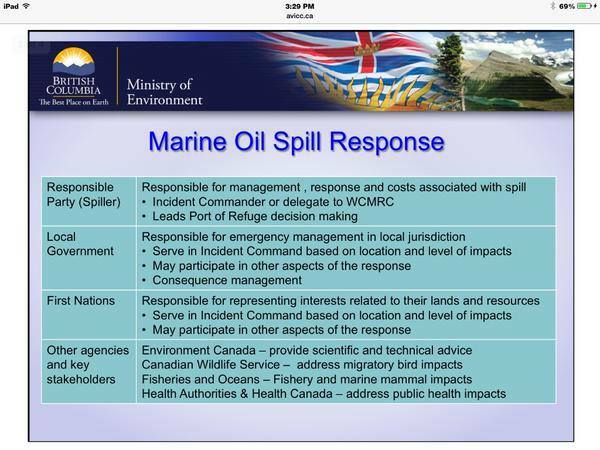 According to The BC Ministry of Environment’s marine oil spill response protocol, the Local Government (i.e. City of Vancouver) is responsible for “consequence management” in their local jurisdiction, which includes health, safety, and information management to minimize the impact of the event on the general public. Even though the city was notified at 7am of the spill, they had no one on the beaches to notify the public until the afternoon, and those on-site, independently volunteering for beach clean-up, didn't even know they were there because their presence was so thin and unobservable. 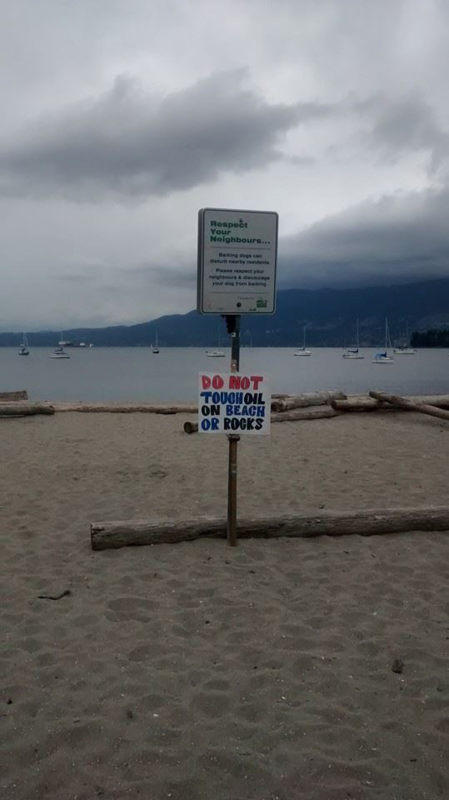 No beaches were closed on April 8th or 9th, despite the highly toxic, hazardous material washing up on multiple shores, potentially affecting the health and safety of Vancouver citizens using our public parks. No city signs were in place until 24 hours after the city was notified of the spill. And still, the morning of April 10th around 11:30am, activists found families bringing their children to play in the water, still unaware of any news of the spill. The city's clean-up volunteer sign-up list wasn't started until low tide had come and gone. High tide would have brought a bunch of the oil already deposited on shore back out into the water if not for the efforts of activists to clean the beach all day yesterday. The city specifically discouraged independent clean-up efforts because of the risks involved, yet no organization made efforts to clean the beach during the first full tide cycle after the spill, despite the fact that the effectiveness of cleaning up Bunker C Fuel oil from the shore drops as the exposed oil is allowed to weather. At least Peter Ross, the head of the pollution monitoring program at the now-closed Institute of Ocean Sciences, showed up. The city didn’t mobilize any clean-up resources on April 9th because they felt it wasn’t their job. And yet, somehow, these jurisdictional issues are manageable when it comes to other health and safety issues in our city's public beach parks. The City pays, or charges for, lifeguards to sit in municipal jurisdiction (the beach above high tide), to provide life-saving services when needed in provincial jurisdiction (the foreshore) and federal jurisdiction (the water). Why was it, then, so difficult to get the city to put workers and signs in their own jurisdiction to warn the public of health and safety dangers in the foreshore and water? 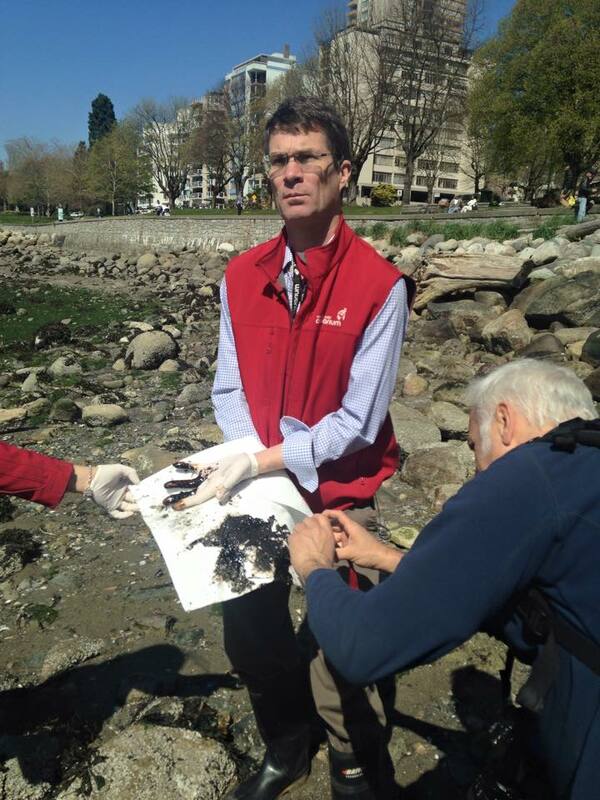 If no higher jurisdiction is taking action to minimize the impact of oil washing ashore, should not the City of Vancouver make some stronger efforts to minimize the consequences of the spill to the health and safety of visitors to their public parks? This is not a world-class spill response. This is pissed off citizens volunteering when people told them not to, in order to risk their safety to do the city's job while the city blames other jurisdictions. This is what the spill looked like from the air at 7am the morning of April 9th.Keep this picture in mind as you read the next few paragraphs. When the federal government, through Transport Canada, tells you that “almost all of the oil in the water had been cleaned up by skimmers on Thursday,” they are neglecting to tell you that skimmers and other mechanical recovery operations, by the feds’ own study, only get 5-15% of the oil from the water under optimal conditions. No. 6 fuel oil is a persistent oil; only 5-10% is expected to evaporate within the first hours of a spill. Consequently, the oil can be carried hundreds of miles in the form of scattered tarballs by winds and currents. The tarballs will vary in diameter from several yards to a few inches and may be very difficult to detect visually or with remote sensing techniques. The specific gravity of a particular No. 6 fuel oil can vary from 0.95 to greater than 1.03. (The specific gravity of seawater is 1.03.) Thus, spilled oil can float, suspend in the water column, or sink. Small changes in water density may dictate whether the oil will sink or float. Floating oil in a high sediment environment (rivers, beaches) could potentially sink once it picks up sediment, resulting in subsurface tarballs or tarmats. On April 9th, oil washed up on Kitsilano Bach, Sunset Beach, English Bay Beach, Second Beach, and Third Beach. After that is when they said things were 80% contained. Then on April 10th, oil washed up in West Vancouver on Ambleside Beach and Sandy Cove Beach. From how far and wide are we getting pollution samples to track the spread? If that weren’t enough, the latest federal budget brings cuts to every safety program at Transport Canada, including a 23% cut to the marine safety budget, and a 32% cut in the budget for transporting dangerous goods. As we’ve seen the feds spend millions and millions and millions more on advertising Canada’s petroleum product extraction industry to the world, they’ve been cutting millions and millions and millions from departments and programs meant to assess the potential dangers of petroleum projects, protect us from those dangers, and respond in the inevitable event of a disaster from one of those dangers. Meanwhile, trains carrying petroleum products in Canada continue to derail, spill, and/orexplode, and the federal government stonewalls concerned citizens. The federal government isn't ready to handle a major oil spill in Canada's waters, even though the coast guard hears of a spill a day on average, the country's environmental auditor says. The unit at Environment Canada that responds to oil-spill emergencies will be dramatically scaled back and most of its regional offices will be closed to meet the cost-cutting demands of the federal government. May 2012: James Moore supports federal shutdown of Kits Coast Guard base, saying“new investments” in the Coast Guard will ensure Vancouver has “the best coastal safety in all of Canada.” He said it wasn’t about money. It was. He said there was broad consultation. Only the Department of National Defense was consulted, no mayors or anyone else involved with the resources required were consulted. He asked reporters to talk to “actual members of the Coast Guard” to gauge how the closure would impact service. The Coast Guard Commander of the now-closed Kits base says the government’s closure of the base was an “absolute disaster”, and confirmed they not only had the now-defunct Osprey response vessel, but also other oil spill response equipment at the closed base, including a thousand feet of boom. British Columbia’s largest oil spill response vessel got stuck on a sandbar en route to a federal news conference about strengthening Canada’s oil spill defences. Only three to four per cent of a relatively small oil spill off the north coast of B.C. would be recovered in the first five days, according to a new study commissioned by the B.C. government. The federal government’s backup plan in the event of a catastrophic oil spill in British Columbia’s waters relies on using chemical dispersants that are currently banned from marine use by the Department of Fisheries and Oceans. The federal government is moving ahead on its intentions to close three BC Coast Guard communications centres. The centre located in Tofino will close April 21, while Vancouver’s will cease operations May 6. A third centre, in Comox, will shut down sometime in early 2016. Employees were notified last week. Marine communication centres are responsible for listening for distress calls and guiding ships, much like air traffic controllers at airports. Scott Hodge, who is with Unifor Local 2182 which represents communications officers, says more centralized operations may mean missed SOS calls. Guess whose supposed to be the first group alerted to spills, oil, pollution, or navigational hazards: The Marine Communications and Traffic Centre and the Port Authority. I guess come May, it will just be the Port Authority? There is at least one other interesting set of facts here. That designated response organization for the West Coast, the Western Canada Marine Response Corporation, is owned by a group of oil companies. While its understandable that they might have the best research and gear to tackle these issues, the specific companies involved deserve closer scrutiny. 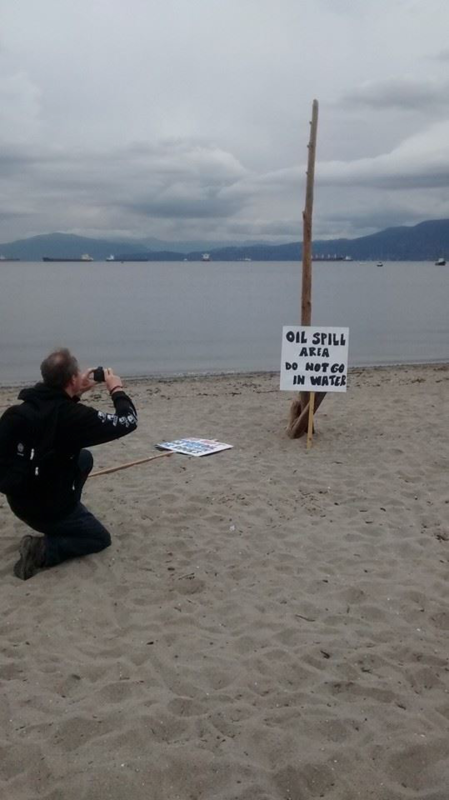 They are Kinder Morgan, Chevron, Imperial Oil, Shell Canada, and Suncor. Kinder Morgan really, really wants to keep their spill response plan a secret, despite them wanting to increase tanker traffic in the Burrard Inlet almost 700%. And they made sure to highlight the positive aspects of an oil spill alongside the negative in their report to the National Energy Board, such as business and employment. Imperial Oil’s parent company is ExxonMobil, who is really, really, really determined to not pay for effective clean up of their own spills through corrupt legislation and politicians, along with everything else. Shell Canada is currently facing charges in Ontario courts for failure to notify the Aamjiwnaang First Nation community of a spill for hours after physical symptoms of reaction had occurred and citizens took their own protocols into action. How comfortable should we be with them owning our designated response organization? Oh, and the WCMRC has a claimed capacity to respond to a 20,000 tonne spill. The Exxon Valdez spilled 35,000 tonnes of oil, only a fifth of its load. A full oil tanker leaving the Westbridge marine terminal has over 80,000 tonnes of oil. Transport Canada only requires that the designated response organization have a 10,000 tonne clean-up capacity. 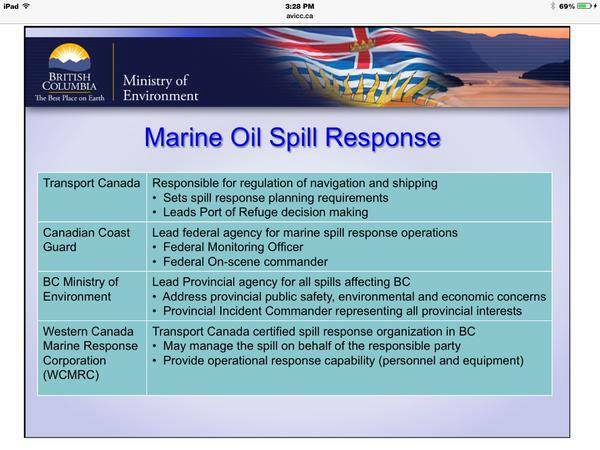 While the WCMRC provide operational response capability and can manage the spill on behalf of the responsible party, they have a publicly advertised response time of “Within 12 Hours” for the Port of Vancouver.